Bar B Q Plaza's franchise has long been established at Malaysia after their very successful business in Bangkok, Thailand. Been there a couple of times and felt that it's worth the price and a rather different dining experience from other steamboat restaurants. So naturally, the restaurant is chosen while having a date with my girlfriend at Times Square, Kuala Lumpur and wandering the shopping center to find a decent place to have dinner. 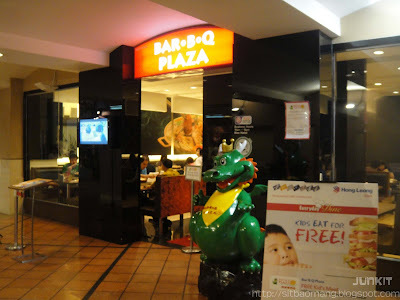 In my opinion, Bar B Q Plaza is a fusion of steamboat and grilling dining concept. Classier and newer if compared to their other branches. The pot/grill station fusion where you get to grill your own meat. 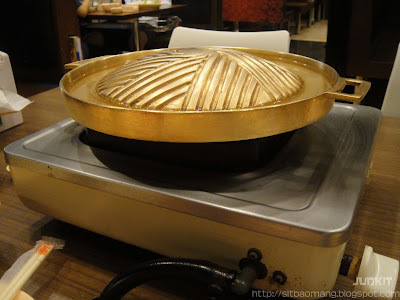 The center of the grill is used to barbecue the meats; while the side of the grill is where soup will be poured into and you could cook your veges in it. 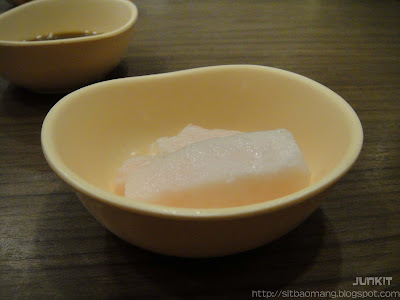 Pork lard! It's a must to fully enjoy the barbecue dining experience. The lards are placed on right on the top center of the grill to let it slowly melt by the heat and ooze out the goodness oil. 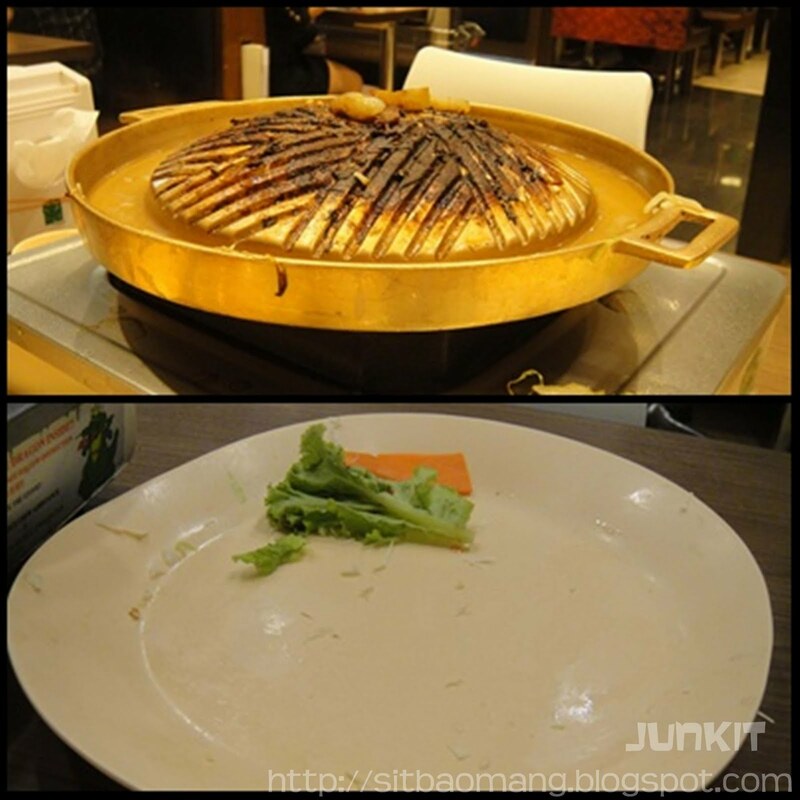 Meats that are placed on the grill would not stick on the grill; plus the aroma and taste is also enhanced by the pork oil. Sweet sauce, dried bird eyes chili, lime and garlic. 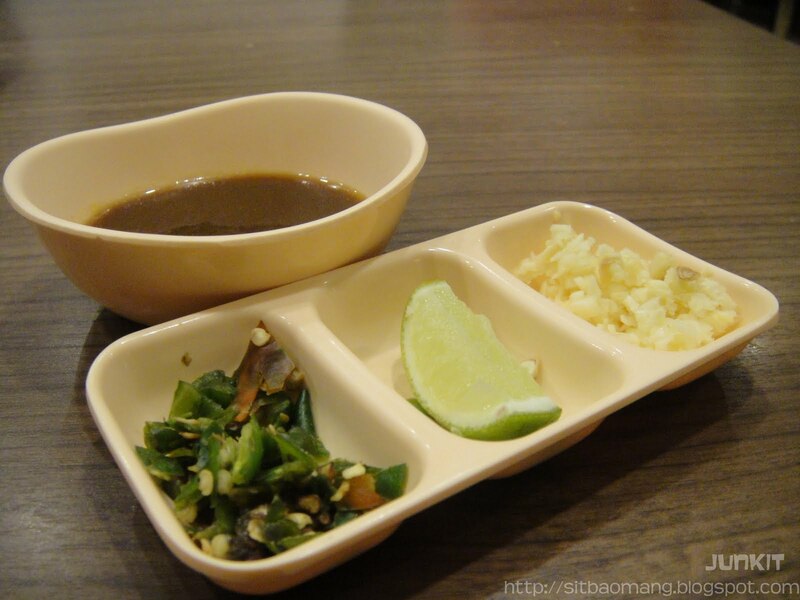 I like to mix all the ingredients into the sweet sauce to get all the goodness in one dip. The Supreme Mixed Set (RM31.90) that we ordered to be shared has beef and pork slices, bacon, chicken meat, squid, prawns and loads of cabbages. Quite fresh I must say. All the sets come with 2 bowls of white rice; and an additional RM 1.50 is charged to each bowl for an upgrade to the garlic fried rice. Place few pieces of meat all SEPARATELY on the grill. Flip the meat to other side and wait around 5-10 seconds. Savor your medium rare meat with the sauce immediately while it's hot! The verdict? Lol basically we finished everything. I guess we were in a very hungry mood that day. Definitely a very enjoyable meal. 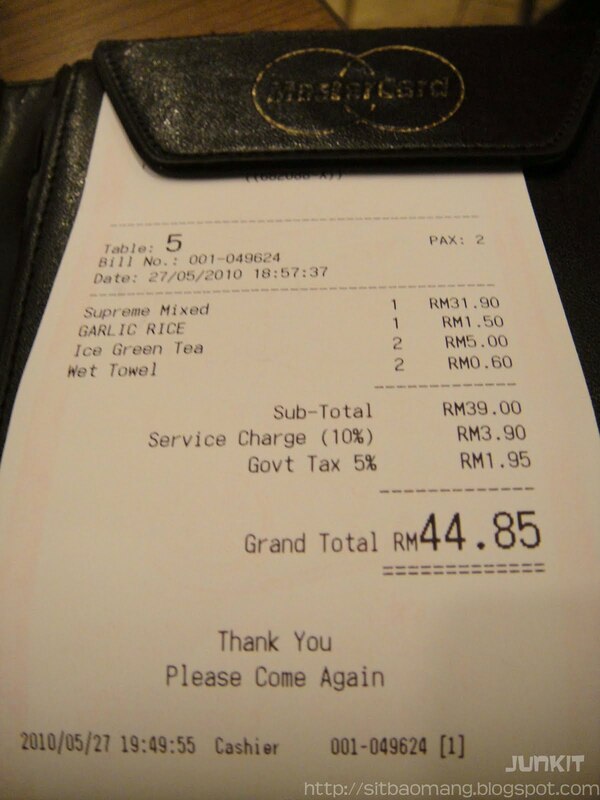 The bill came up to RM44.85 with 2 cups of green tea. The green tea is refillable though. Quite worth it considering the amount of meat cuts. However I honestly felt that the branch in Times Square could greatly improve on their staff attitude more; given the restaurant's concept. Staffs are not friendly and have this moody/as-if-I-offended-them face. Mainly I think because most of the staffs are leaving school kids or kids who are on part time job. But I still believe they must improve and give strict warnings if they would want more business. A good way to spend time after a great dinner - a visit to the cinema! 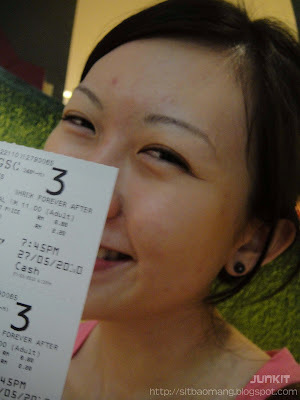 Shrek Forever After; not bad and very hilarious. Darker story this time as compared to the previous Shrek movies. We were still kinda hyper-ed up after movies, so we headed for a late walk at the night market at my housing area. OUG's (Overseas Union Garden, Jln Klang Lama) pasar malam is on every Thursday and has a mixture of bargains and good food to be found. The must get food I have every Thursday is the China burger. 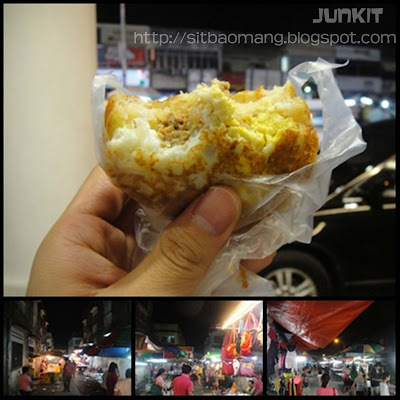 Not to say exactly tasty, with just flour, egg and minced meat. I guess it's an acquired taste, or an old habit of mine. Lol. 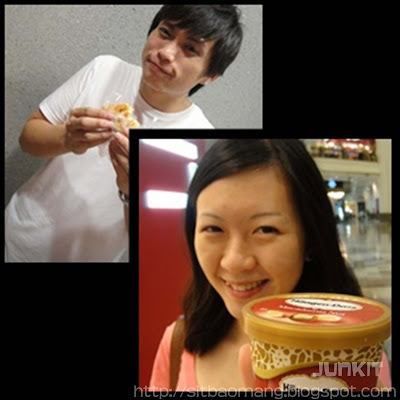 Address : Lot 03-83, Berjaya Times Square, No. 1, Jalan Imbi, 55100 Kuala Lumpur.